If you've shopped with us, visited our store, know us personally, or even read our blog, you have a good idea how passionate and proud we are that our Lousje & Bean clothing line is 100% Canadian Made. Sourcing our fabric from local suppliers, having our pieces made by seamstresses right here in Ontario, and using our own original designs, we ensure that our entire creative and manufacturing process takes place in Canada. This is important to us for many reasons, including quality control, supporting our local economy, preserving the highly skilled art of sewing, and creating timeless pieces that will stand up for years to come and will not be disposable. We love making clothes in Canada, for Canadian women who truly appreciate the craftsmanship and dedication that goes into each and every piece. These reasons alone have always been more than enough to remain proudly Canadian, however, after recently discovering the book Overdressed: The Shockingly High Cost of Cheap Fashion by Elizabeth Cline, we have further realized the positive impact that locally made clothing has on our lives and the environment. 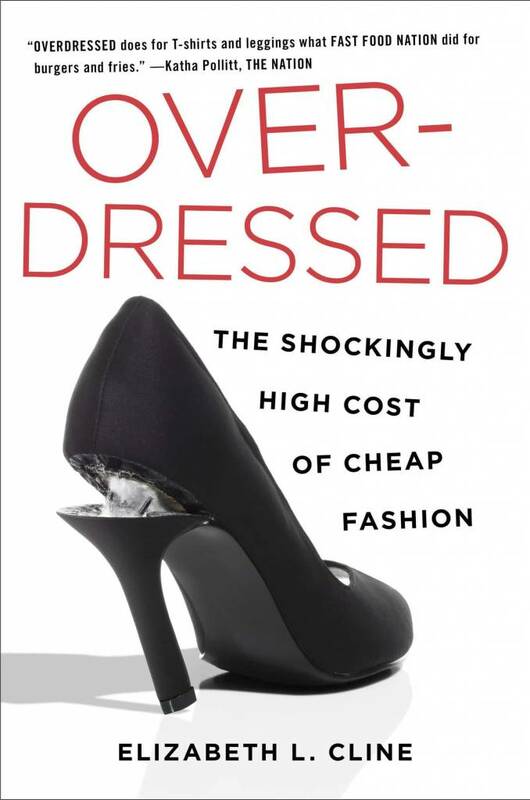 We thought we'd share a little bit of what we have learned from reading this book in the hopes that you, too, may discover a new perspective on how the changes in the fashion industry and our buying habits are affecting more than just our wardrobes. But what are we doing with all these cheap clothes? And more important, what are they doing to us, our society, our environment, and our economic well-being? In Overdressed, Cline sets out to uncover the true nature of the cheap fashion juggernaut, tracing the rise of budget clothing chains, the death of middle-market and independent retail­ers, and the roots of our obsession with deals and steals. Elizabeth Cline has opened our eyes to how we ourselves shop and the importance of maintaining our standards and mandate to remain Canadian made. While we are not perfect and find it extremely difficult to avoid all overseas purchases in our own lives, we do strive to remain as conscious as possible when shopping for ourselves and the store. Not everything will be North American made but there are plenty of nations to support in a responsible way. For instance, while our fabric is sourced from local suppliers, the textiles themselves are often made in Europe by artisans in a sustainable and conscious manner. We pay more for these fabrics that are built on quality by designers and manufacturers who were paid a fair wage and are masters of their craft. When you purchase our clothing you can be sure that it has been made responsibly, with attention to quality and sustainability at every step, and you can guarantee you won't find a cheap, Chinese made replica of our pieces sold for pennies on the dollar in other stores. We are committed to providing you with one-of-a kind designs, tailored to perfection (by the way- did you know we offer free alterations on any of our regularly priced pieces? ), and made to last. We hope you learned a little about Fast Fashion and gained an understanding of why we think making and designing our pieces in Canada is so important, the cost of doing so that is reflected in our pricing, and why those other cheap clothes aren't as cheap as you think! Tell us what you think- do you agree with the message of Elizabeth Cline's book, or are you a die hard trend shopper?